The most complicated real estate tax system in the country is about to get even more confusing. On Thursday, Mayor De Blasio announced his proposal for a “mansion tax.” The tax would be levied on buyers of condos, coops, or houses that sell for $1,750,000 or more. Mayor de Blasio also called for the authority to implement a City ‘Mansion Tax’ on the sale of high-value condominiums, co-ops and one-to-three family homes, with revenues lock-boxed specifically for the construction or preservation of affordable housing. According to recent sales data, the policy would affect approximately the top 10 percent of residential real estate transactions. Despite referring to the tax as “The Mansion Tax,” there was no mention of the fact that New York City already has a mansion tax on sales of $1M and up (more below). The “notch” I am referring to the $1.75 million price at which the tax takes effect. Under the tax, a home selling for $1,749,999 would owe nothing. But one selling for $1,750,000, a dollar more, would owe $17,500. To see the effect such a notch would have, you just have to look to the effect of NYC’s current mansion tax. 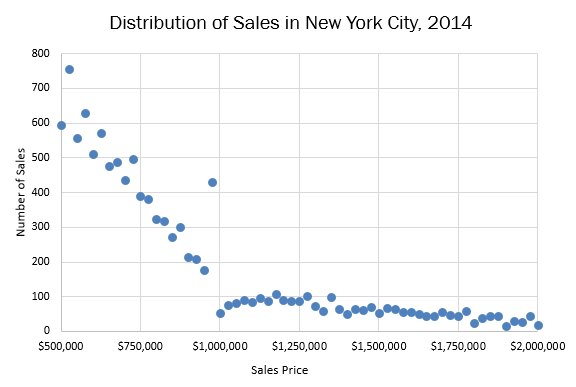 For the chart below, I took all NYC sales (coops, condos, and houses) from 2014 and grouped them into $25,000 price bins. A healthy, efficient looking market? The effect is extremely apparent. There is a bunching up of sales just below $1M, and a drop off in sales just above $1M. This effect has many implications for the housing market, as covered in this excellent piece of research by two professors at Columbia University. As they demonstrate, the market “unravels” in the neighborhood of the notch. For example, it appears that even though the tax on a $1 million property is $10,000, some sellers may offer up to $20,000 in discounts to avoid the tax. The number of sales getting bunched up below the notch does not fully account for the size of the gap above the notch. In other words, transactions that would otherwise take place are prevented by the presence of the tax. For homes priced above $1M, the tax also significantly increases the time on market. It also breaks down the relationship between the offer price and the final sales price. These effects further highlight why the mansion tax would disproportionately affect sellers. It also demonstrates that the tax would have negative consequences for real estate agents as well. Maybe most surprising of all, the paper shows evidence that property developers adjust the characteristics of newly constructed homes in order to avoid the tax. For example, imagine a scenario whereby a developer could raise a unit’s sale price from $997,000 to $1,007,000 by spending an additional $5,000 on a better flooring material. Under normal circumstances, doing so would be a no brainer. However, in the presence of the mansion tax, there is a strong incentive to keep sale prices below $1M. And improving the flooring would generate a loss. As the study concludes, these negative effects would be reduced and tax revenues would be higher if the tax were implemented in a gradual way, rather than as a sudden notch. I can appreciate the point, but it should not come at that expense. Based on last year’s sales (downloadable here), the new mansion tax would have affected about 10% of transactions and generated tax revenues of about $70M. This number is much lower than the $180M – $200M annual revenue estimates mentioned in the announcement. The difference may be due to the new “billionaire’s row” condos set to go up in future years.